Many years ago, someone gave me a piece of Ferrara Pan‘s Atomic FireBall candy. They’re blazing hot cinnamon jawbreakers, and they’re incredibly hard to find here (and if you do they’re not cheap). The first full day in Vegas, we took a quick trip to a Smart & Final store, a warehouse Costco-style store that doesn’t require a membership. Along with drinks and a giant box of granola bars, I excitedly grabbed a giant 200 count countain of Atomic FireBalls for about $13 US. It took up a huge chunk of space in my suitcase, but the case is going to last me forever. They also had jars of Lemonheads, but I didn’t want to buy quite that much of a candy that I hadn’t tried before. Instead, at a candy store in the airport, I picked up a few different candies to nibble on while waiting for my flight home. The Lemonhead was definitely sour, but I think I prefer the Japanese Nobel Super Lemon candy as that one is much more mouth puckering. Atkinson’s Peanut Butter Bar was like sucking on a piece of peanut butter if it came in a hard form. The Bit-O-Honey is a honey flavoured taffy that has teeny tiny bits of almond embedded in it. It was okay but not as good as the other two candies. 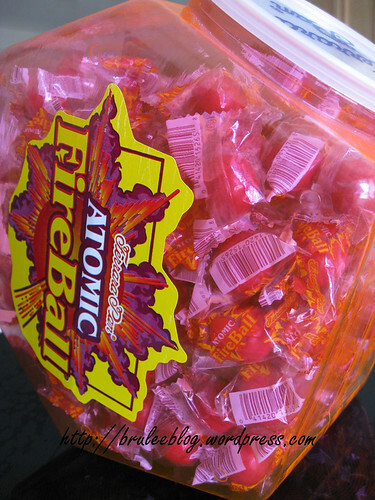 It was interesting to try some new candy (well, new to me at any rate), but I’m more than satisfied with my giant jar of Atomic FireBalls and do not regret refraining from buying large quantities of any other candy. Smart&Final used to be even more exciting when they had all the commercial kitchen equipment for sale. Still a great store with great prices. I have never been in a Smart&Final, but when visiting my parents in Palm Springs we speculated endlessly about what kind of place it might be (funeral services?). I’ll have to actually check it out next time we are down there. It basically looks like a mini Costco. 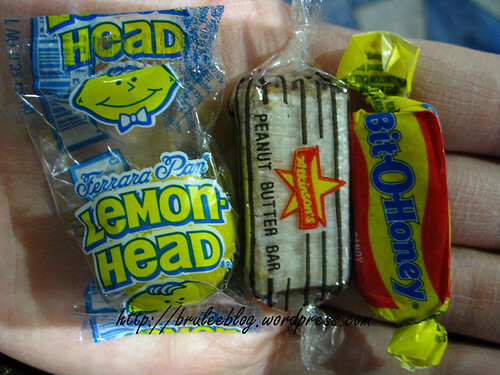 That’s the candy of my childhood. I’m not so sure how much I’d like it now. I’m not so much for candy anymore. Bruleeblog: Nice score at Smart & Final. And great photos! S&F stopped carrying the larger count containers and now only have the 140 ct…still, though, a sweet deal at $8.75. Only problem is, they have been out of stock for a long time. Apparently, the supplier has been having problems with production. This is the best candy…period. The owner, Mr. Ferrara who recently passed away at age 93, swore one piece per day was the secret to his longevity. I’m on board!